There’s a shiny new plaque on the office wall in Gainesville, Florida – the Patriot Award. While it’s inscribed with Gregg P.’s name, he’s the first to tell you the honor should be shared. 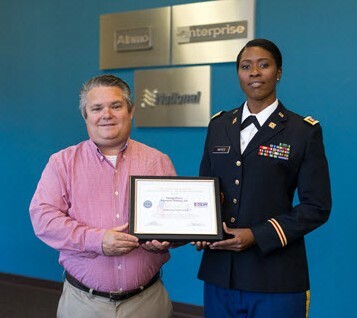 Shared, first, with Verrice H., an Enterprise Recovery Specialist who is also a Captain in the U.S. Army Reserves. It was Verrice who nominated Gregg, Damage Recovery Manager, to receive the recognition from the Employer Support of the Guard and Reserve (ESGR), a Department of Defense program. It honors the efforts employers make to support citizen warriors through a variety of measures such as flexible work schedules and leaves of absence. Gregg says the award should be shared, too, with Verrice’s co-workers and direct supervisors – all of whom have pitched in to cover the workload when she was deployed or called into military training since joining Enterprise in 2013.